The Fellowship was fortunate enough to obtain a copy of MARKSMEN #6 from Image Comics. David Baxter writes, Javier Aranda pencils, Beny Maulana colors, and Bebe Giraffe letters. This book is the end of a six-issue arc in a post-apocalyptic war zone, Wild West style. The battle for New San Diego is nearly over, but it’s been a bloody one. The Marksmen have acquired a weapon that will win it, but will Duke and the Deacon escape? Forgive me for saying so, but it’s refreshing that there are even a few post-apocalypse stories out there that aren’t crawling with zombies. This one is especially refreshing in that it’s got a strong group of characters; this arc closer is rife with dramatic endings and beginnings (without actually being overdramatic, which I like). And it’s a battle, so we have lots of big explosions that are well drawn. 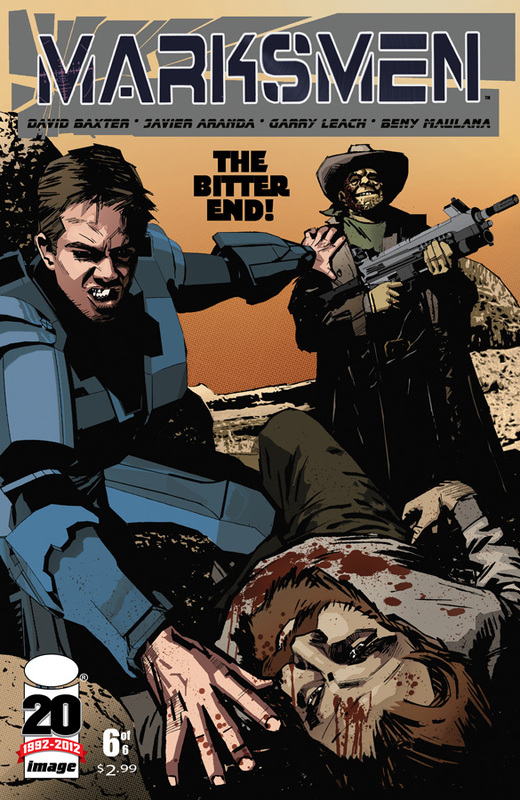 MARKSMEN #6 is available now at your FLCS or by order from imagecomics.com.